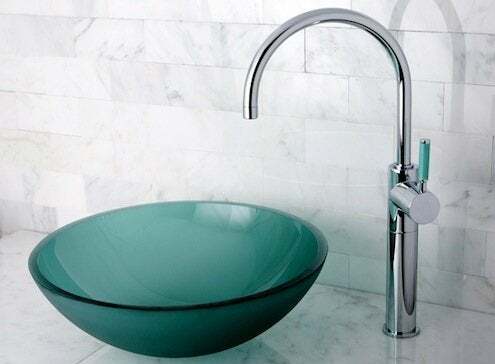 Unlike standard bathroom sinks, vessel designs sit above the counter surface. Reminiscent of historical bedroom washstands that consisted of a wash basin and pitcher for freshening up, current vessel sinks utilize modern materials and designs to sculptural effect. Since vessel sinks are top-mounted, you’ll have to adjust your counter height to accommodate for the vessel’s depth. Since standard sink rim height is 34″ high, subtract your vessel’s depth from 34″ to figure out the ideal countertop height. You might try retrofitting a vessel sink to an existing console or dresser under 30” high to achieve an ergonomic sink height. You’ll also want to consider its location. 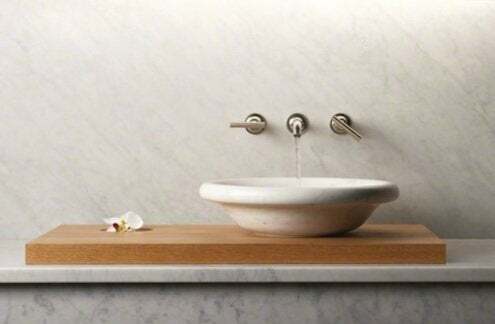 Vessel sinks are usually found in powder rooms and guest baths where they see lighter use, typically just hand-washing. That’s because this type of on-display design requires a bit more cleaning and maintenance than your average below-deck sink. For instance, a clear glass sink will show watermarks or dirt, so you’ll want to wipe clean frequently. A copper sink’s living finish will develop natural patina and is therefore less fussy, so that may be a better choice in a frequently used master or main bath. Whatever material you choose, make sure the sink base doesn’t have tight angles; you’ll want a base that’s easy to clean around. As with most fixtures, use non-abrasive cleaners to keep your sink in top form. The faucet pairing and placement requires forethought as well. A wall-mounted faucet is common, but a carefully selected deck-mount faucet will also do the job. Like with other projects, site measurements and product dimensions are majorly important. Keep in mind that the faucet must be long and tall enough to reach the basin. Also be sure to position the faucet so that the nozzle sits directly over the drain to avoid bothersome splashing. If you’re after eye candy, vessel sinks are the way to go. Don’t miss our gallery Vessel Sinks: 10 Works of Art for a set of fine examples from around the market, at every price range.